The 35,893 fans filling Nationals Park on a breezy Friday evening of the 2015 Memorial Day weekend might have been expecting a memorable pitching performance from Max Scherzer (4-3, 1.75 ERA). They were not disappointed.1 What they were probably not expecting was that Max’s success at the plate and on the base paths, not just on the mound, would bring the Nationals a much-needed win. The Nationals (24-17) were leading the division, but just a half-game ahead of their National League East rival New York Mets. Expectations were probably not as high for the Phillies’ Sean O’Sullivan (1-2, 3.68 ERA). 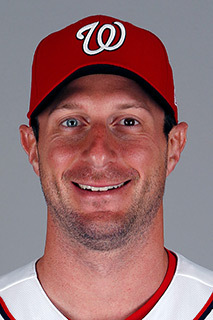 The last time he had earned a win on the road was May 12, 2011, pitching for Kansas City.2 Scherzer and O’Sullivan had faced off twice already in 2015: April 12 at Philadelphia, with no decision for either pitcher; and April 17 in Nationals Park, with Scherzer earning the win in that game. But the Phillies (18-25) had won seven of their last nine games, so the many fans who made the trip down from Philadelphia could have had realistic expectations of a good weekend as well. Scherzer started the game in his usual dominant fashion,3 needing only 11 pitches to retire the first three Phillies on a popout, a strikeout, and a fly out. O’Sullivan nearly matched Scherzer, although it took him 15 pitches to retire the three Nationals hitters, including two strikeouts looking. Ryan Howard opened the second inning with a double off the wall in center field, his first hit in eight at-bats against Scherzer in 2015. The play at second base was close: Denard Span’s throw in was accurate, but Yunel Escobar’s tag was just a little late as Howard slid under the tag. Then Maikel Franco hit the ball back to Scherzer on a bounce, allowing him to catch Howard in a rundown. Scherzer made an easy toss to Ian Desmond standing to the left of second, and Howard was out. After Grady Sizemore struck out on a foul tip, Odúbel Herrera almost homered, but had to settle for a double off the top of the center-field wall. Franco scored standing for an early 1-0 lead for the Phillies. Obviously a small sample size, but that hit brought Herrera to 4-for-8 against Scherzer in 2015. Scherzer struck out Carlos Ruiz swinging to end the half-inning. The Philadelphia lead did not last long. Bryce Harper led off, fouled off several pitches, then tied the game with his league-leading 16th homer into the flower bed just over the left-field wall. He was on what might be called a “hot streak” of 11 homers in the previous 14 games. O’Sullivan rolled his eyes at the sky, got back on the mound, and got the three outs he needed on two fly outs and a groundout. O’Sullivan came to the plate in the bottom of the third still looking for his first hit. He didn’t get it: His pristine .000 BA went unsullied when Scherzer struck him out on three pitches. Ben Revere hustled to first on a broken-bat flare to right, but was left there when Freddy Galvis flied out to Span on the warning track and Chase Utley popped up to Desmond — who didn’t even have to move to get under the ball. In the bottom of the inning, O’Sullivan struck out Danny Espinosa looking. Scherzer and Span both grounded out. Scherzer had better luck against Howard to open the fourth: Howard struck out swinging at an off-speed pitch at his feet. A Franco comebacker tossed to first, a Sizemore fly out to Span on the warning track, and the half-inning was over on 13 pitches. In the bottom of the inning, O’Sullivan needed only seven pitches: Desmond flied out on the first pitch, Escobar singled past a diving Galvis on the first pitch as well, but then Harper grounded into a 6-3 double play. Scherzer opened the fifth inning by walking Herrera on a full count, only the ninth walk he had allowed all season. The Phillies put Herrera in motion on a 1-and-1 pitch, so Ruiz’s comebacker to Scherzer advanced Herrera to second, avoiding a double play. With O’Sullivan batting, Scherzer turned around several times to check on Herrera, apparently concerned that he was either stealing or stealing signs. O’Sullivan did connect this time, but it was an easy fly out to center. A Revere groundout to first ended the half-inning. In the Washington fifth, Ryan Zimmerman bounced one over O’Sullivan for a base hit, but Wilson Ramos’s groundball down the third-base line allowed Utley to throw to second for a force out of Zimmerman. Ramos was left at first when Clint Robinson lined out and Espinosa hit one right to Howard at first base. In the sixth, after Galvis popped up to Desmond, Utley doubled off the center-field wall. Howard grounded out to Espinosa in short right, who made a quick throw to first to stop Utley from advancing past third. Utley was left at third when Franco flied out. Scherzer opened the bottom of the inning with a line drive into right field for his fourth hit of the year.4 He had nearly been out on a ball that fell just foul, but none of the three converging Phillies managed to catch it. Scherzer was hustling hard to first — if the foul ball had fallen in, he would have been on second. As it was, he was safe on first with a big grin.5 Span flied out, then Desmond doubled off the top of the wall in center. That allowed Scherzer to score, running all out from first, although he stumbled a little rounding third. Broadcasters and some fans were surprised that the Nationals’ third-base coach, Bobby Henley, would send a pitcher on a relatively close play, but his nickname was “Sendley” for a reason.6 An Escobar groundout advanced Desmond to third. Phillies manager Ryne Sandberg then held up four fingers to signal an intentional walk to Harper, with the crowd booing loudly. The strategy paid off, as Zimmerman grounded out to third, but the inning ended with the score 2-1, Nationals. All that running didn’t seem to fatigue Scherzer; despite working up a sweat on the basepaths he worked a 1-2-3 top of the seventh on 12 pitches. Luis García took the mound for Philadelphia, and was successful in holding the score. He struck out Ramos, then Robinson got a base hit. Nationals manager Matt Williams put in Michael A. Taylor as a pinch-runner for Robinson, but Garcia picked off Taylor while Espinosa was batting. Espinosa struck out to end the inning. Scherzer took the mound for the eighth: his pitch count was only 97, and he had been averaging over seven innings per start. He needed only 13 more pitches for a 1-2-3 inning, bringing his total to 110. He exited to a standing ovation and handshakes in the dugout, having surrendered only four hits and a single run in eight innings. Ken Giles arrived on the mound for the Phillies, but started shaking his pitching hand after a warm-up pitch. That brought Sandberg, the trainer, the entire infield, and the umpire to the mound — but it was only a cut on the thumb, quickly patched by the trainer. It couldn’t have bothered Giles too much: he didn’t give up a hit, although he did walk Desmond. Drew Storen, the Nationals’ closer, came in to face the heart of the Phillies order in the ninth, starting with Utley, who singled over Desmond’s head. With the outfielders playing a no-doubles defense, Desmond couldn’t quite get to the ball. Howard, who came in 4-for-7 against Storen, struck out on a slider. Then Franco hit into a circus play at second. It initially looked like a game-ending double play, but the ball bounced off both Desmond and Espinosa, although no one was charged with an error. With two on and only one out, Storen had no margin for error. He got Sizemore to fly out to Taylor for the second out. That brought up Herrera with two on, two out, and the crowd standing and cheering “Druuuuuu.” Storen struck Herrera out swinging at a high fastball for his 13th save, preserving the 2-1 win for Scherzer, and giving the Nationals six wins in a row. The crowd was treated to a well-played, well-pitched game from both teams, but Max Scherzer clearly was the player of the game, given his overall contribution to the win. I was in attendance at this game. I remember gasping when Henley waved Scherzer home: knowing Scherzer’s competitive streak, the risk of a slide or injury was all too real. 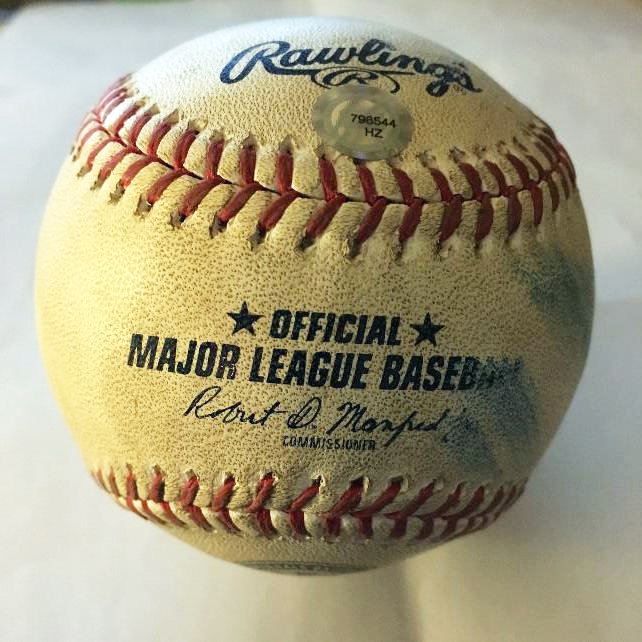 This baseball from the Nationals-Phillies game, acquired via Nationals Authentics, is now in my collection. MLB.TV recording; 106.7 FM Washington, DC, radio recording; personal notes. 4 Scherzer also fouled one behind the plate during his at-bat. The author acquired that ball (photo above) from Nationals Authentics the next day. 5 He considered himself to be a good hitter for a pitcher: This game raised his batting average from .150 to .182. 6 washingtonpost.com/news/nationals-journal/wp/2017/11/04/bob-henley-will-return-as-nationals-third-base-coach/?utm_term=.d62f9c4f6986. Chelsea Janes, “Henley Will Return as Nationals Third Base Coach,” Washington Post, November 4, 2017.